We are not exactly sure how this trend got started, but concrete countertops are popping up in all kinds of kitchens from modern to traditional. And for us, it is easy to understand why. For many do-it-yourselfers, it is relatively easy to install. For the budgeted minded, it is cheaper than natural stone while possessing many of the same enduring qualities. Learn how concrete countertops can infuse both style and function in your kitchen. The remodeling brief for this vibrant kitchen was to create a modern and comfortable space. R2 Studio Architects based in London, England, rose to the task with colorful cabinetry, rubber flooring, and concrete countertops. The latter has a hand-troweled roughened finish that contrasts nicely against the smooth cabinets. There are ways you can alter the color of concrete. Here is an example in a modern kitchen by U.K. based Paper House Project. A pigment mixed into the concrete before setting gave these charcoal gray countertops their dark color. Function and style define this traditional kitchen by Rosa Beltran Design based in Los Angeles, California. Concrete countertops offset the Moroccan tile backsplash. Classic shaker style cabinetry provides plenty of storage space. Vintage inspired task lighting lends an industrial edge. Yes, concrete countertops beautifully work in this luxurious cooking space by Anthony Wilder Architecture and Interiors based in Cabin John, Maryland. The honed countertops offset the glossy, gray subway backsplash. The crowning jewel in the space is the ice blue range by Lacanche. Here, E2 Architecture and Interiors out of London, England adds a concrete countertop to an island in a modern kitchen. The rugged surface lends an interesting texture to the sleek space. If you think concrete countertops will not work in an elegant setting, this Swedish kitchen spotted on Alvhem will prove you wrong. Thick slabs of honed concrete are paired with traditional, white cabinetry. For an unexpected pop of pretty the homeowners covered the wall with floral patterned wallpaper. A glass backsplash protects it from splatters and stains. Holmes Hole Builders situated in Vineyard Haven, Massachusetts combined several different décor styles in this kitchen. 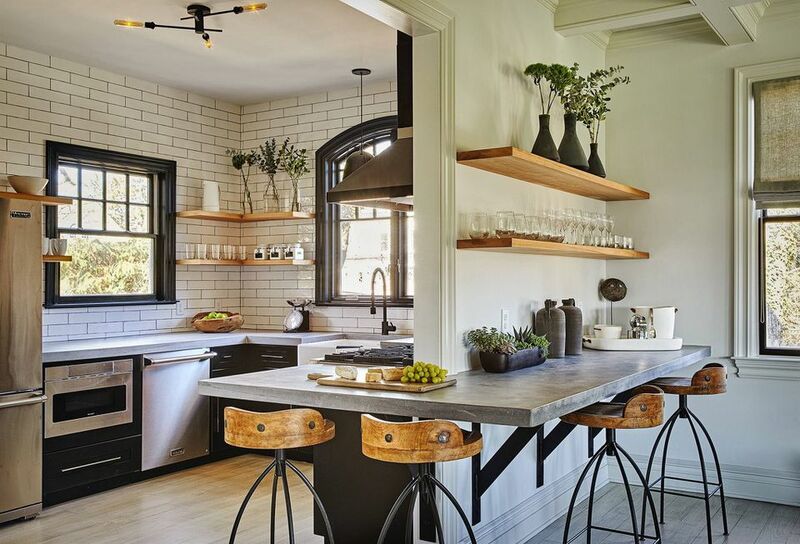 Reclaimed wood walls, a hallmark of modern farmhouse style, frame the kitchen. The concrete countertops add an industrial edge to the traditional cabinetry. Ultra modern appliances like the double door stainless steel refrigerator add function and value to the cooking space. For around $200 you can transform your old laminate countertops into beautiful concrete with this DIY by Taryn Whiteaker, the blogger behind Design, Dining, and Diapers. She applied a concrete product designed to fix gouges and ridges in concrete subfloors to her existing countertops. Before applying she roughed up the laminate surfaces using a box cutter and then thoroughly cleaned them so the concrete mixture would stick. Once the concrete dries and sets, you should expect to spend up to seven hours sanding your new countertops to get an attractive honed finish. Here is an eco-friendly kitchen in a home constructed by Pinnacle Custom Builders out of Decatur, Georgia. All the materials in the cooking spaces are zero VOC. The stylish countertops are a mix of concrete and recycled glass in a style called Emerald Coast by Vetrazzo. The yellow cabinetry is 100 percent recycled content. This bespoke cooking space by U.K. based The Vawdrey House features a dropped ceiling that creates a little separation from the main living area. The custom cabinetry has shiplap doors painted a striking shade of blue-black. Adding a bit of shimmer to the cooking space is the black backsplash made of glossy fish scale tiles. Thick concrete countertops provide extra workspace. We are particularly fond of the sizable natural wood kitchen island with a cast concrete topper. White subway tile, natural wood shelves, and concrete countertops give this cooking space by Greenwich, Connecticut based interior design firm, Garden Designs a distinctive retro-industrial vibe. On the right is a small eat-in area with a wall mounted concrete counter and four Arteriors Henson Counter Stools. A tiny kitchen gets a big dose of practical function with concrete countertops. Instead of casting the counters in place, Thibaut and Thewood, a design firm based in Paris, France, poured and set the concrete in molds before installing. Let's face it, quartz or marble countertops costs thousands of dollars. But that should not stop you from creating the classic kitchen of your dreams. This gorgeous cooking space by Homewood, Alabama based Adams Gerndt Design Group opted for honed concrete countertops. The money-saving decision allowed the homeowners to spend a little more on other kitchen features including extra custom cabinetry in both white and navy blue, and a vintage brass gooseneck faucet. These days many kitchens mix and match countertop materials. Case in point, this white cottage kitchen by Hendricks Churchill, an interior design firm based in Sharon, Connecticut. Along the walls are marble countertops. The wood center island features a dark gray concrete topper. A home in the middle of Sonoma's wine country is transformed into a Tuscan-inspired villa thanks to Ken Linsteadt Architects based in San Francisco, California. The kitchen features reclaimed timber with a refined finish. Topping the kitchen island is a concrete countertop that is a lovely fit for the home's polished yet earthy vibe.